ommy Lavelle; Debbie Ormiston; Cllr Sinead Guckian; Suzanne Duffy; Nancy Healy; Cllr Sean Mc Gowan; Cllr Finola Armstrong McGuire; Marian Harkin, MEP and Cllr Enda Stenson. 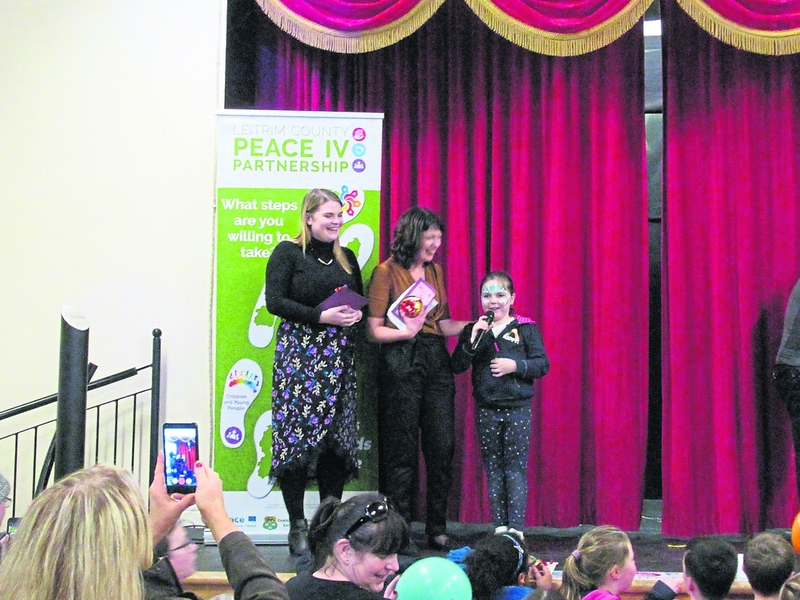 The closing event for PEACE IV project ‘Connect and Respect’ took place in the Mohill Family Resource Centre, Canon Donohue Hall, Mohill recently. 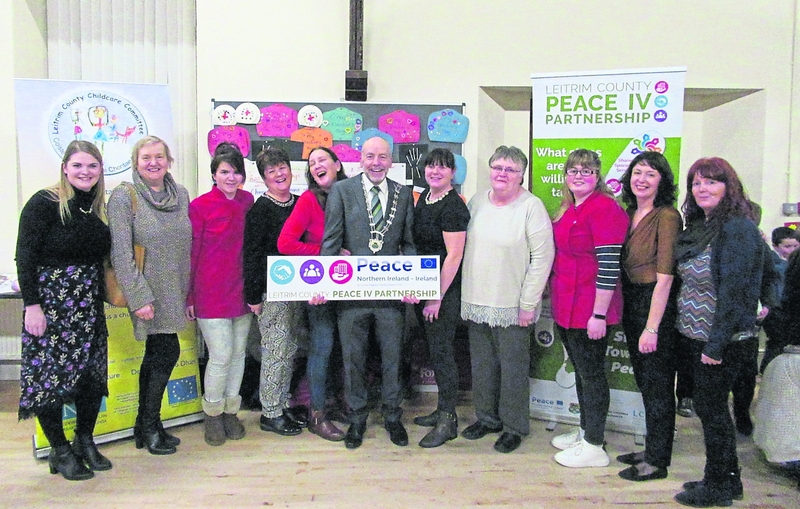 Funded by County Leitrim Peace IV Partnership under the Peace IV Programme, ‘Connect and Respect’ was developed by Leitrim County Childcare Committee. Pictured are Nancy Healy, project worker Leitrim County Childcare Committee; Jean Doyle, Kinlough Community Childcare; Emer McCartin, Carrigallen Community Childcare; Deirdre Harvey, Ballinamore Community Childcare; Pauline Mc Govern, Dowra Childcare Services, Sean McGowan, Cathaoirleach LCC; Majella Higgins, Mohill Afterschool; Phyllis Beirne, Ballinamore Community Childcare; Aoife Tierney, Carrigallen Community Childcare; Debbie Ormiston, project worker Leitrim County Childcare Committee and Sheila Flynn, Shannonside Community Childcare. Nancy Healy and Debbie Ormiston, Leitrim County Childcare Committee project workers, worked closely with seven afterschool services and over 80 children from various locations throughout Leitrim. Together they explored the value of friendship, building relationships, realising differences and working together in a fun and creative environment. The event was a fun-filled celebration which brought all the children who attended the project for one last big get together and was well attended by local councillors, public representatives, service providers and children and families from all across Leitrim. Nancy Healy and Debbie Ormiston - project workers for Leitrim County Childcare Committee with Kate Marie Stokes - a child who took part in the programme from Shannonside Community Childcare. The project workers expressed their thanks to all the staff, managers and Boards of Management from the afterschool services who had participated in the project, Dowra Childcare Services, Kinlough Afterschool, Shannonside Community Childcare, Ballinamore Childcare, Carrigallen Community Childcare, Eivers Lane and Mohill Afterschool and especially to the practitioners who worked directly on the project and were such a huge support. The innovative project has been deemed a huge success. Organisers said that this was really due to the energy and enthusiasm of the children who took part in it and made it such a fun and worthwhile experience. As Leitrim County Council Cathaoirleach, Cllr Sean McGowan stated at the closing event: ‘The value of bringing our young people together and creating the opportunity for them to talk about their feelings, giving them tools and strategies to build their resilience, supporting them to deal with difficult situations that will arise as they walk through life is more important now than ever. “This project has been rich in these experiences for all who took part and they will carry this learning onwards in their day to day life. Well done to everyone involved in this project.